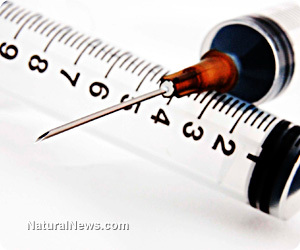 The saved CDC information comes right out and admits that more than 98 million Americans during a span of eight years were injected with a cancer-causing polyomavirus called SV40. This fact alone should serve as a testament to anyone: always question medical professionals who say that you or your child needs a certain vaccine or prescription. So much "medicine" today is actually poison. Professionals are often duped into believing in the safety of a vaccine or prescription, when all along it may be laced with cancer-causing, health ravaging virus, heavy metals, fungus, formaldehyde, or neurotoxins. SV40 stands for Simian vacuolating virus 40 and was found in monkeys in 1960. This polyomavirus existed in contaminated batches of polio vaccinations in the 50s and early 60s. Fragments of this virus have shown up in human brain, bone, and lung cancers. This virus is known for causing cancerous tumors. Uniquely, humans have built in tumor-suppressing genes. The SV40 virus effectively disables those genes, suppressing them through the SV40 T-antigens. This leads to mutated genes that spawn uncontrollable cellular proliferation, leading to cancer. Michele Carbone, Assistant Professor of pathology at Loyola University in Chicago, has recently found fragments of the SV40 virus in 40% of human bone cancers and in 60% of mesothelioma cancers. Experts in the field are beginning to conclude that the Salk and Sabin polio vaccines were responsible for injecting cancer-causing viral strains into people, mutating their genes and welcoming epidemics of cancer. The contaminated vaccine has been estimated to have adversely affected 10 to 30 million people. SV40 was first found by Dr. Bernice Eddy when she studied the minced kidney cells of rhesus monkeys. "The cells would die without any apparent cause," she reported. Taking the cells from the monkey's kidney cultures, Dr. Eddy injected them into hamsters. Merck & Co. soon discovered this virus, which was identified and isolated by Dr. Eddy. It was named Simian Virus 40 because it was the 40th virus found in monkey kidney cells. In 1960, the discovery was complete. Merck scientists Dr. Benjamin Sweet and Dr. Maurice Hillman published the findings. Dr. Eddy went on to publish more information about the SV40 virus. A single dose was injected into 13 newborn hamsters and 10 newborn mice. What followed was cellular neoplasms that developed between 156 and 380 days. Still though, at the time, medical professionals defended the SV40 tainted polio vaccines, despite the published dangers of the SV40 virus contaminating the vaccines. With the CDC coming out and admitting that millions of Americans were exposed to cancer causing SV40 viruses in the polio vaccines between 1955 and 1963, there will be increased skepticism about vaccinations in the years to come. Maybe that's why billionaire vaccine pushers made the CDC take this important information off their site.